The Royal Opera House, in its appeals for donations, says that ‘£4.50 buys a pair of 12″ laces’ as an encouragement to give generously. But let us pause for a moment. £4.50 for a single pair of laces? That seems a little steep. My reaction to that appeal was not ‘I must help the ROH cover the cost of these sophisticated items’ but rather ‘Hmmmmm: the ROH are paying too much for their laces’. It got me thinking about the cost of theatrical costumes. Is the desire for artistic merit (and awards) trumping economic common sense? Are costumes over-engineered? Take the character Elphaba from Wicked. 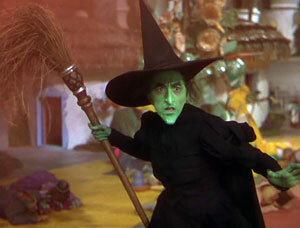 She is, of course, based on the Wicked Witch of the West in The Wizard of Oz. In the 1939 movie, the Witch wears a black dress. Here’s Elphaba in the musical, wearing what looks like a black dress. 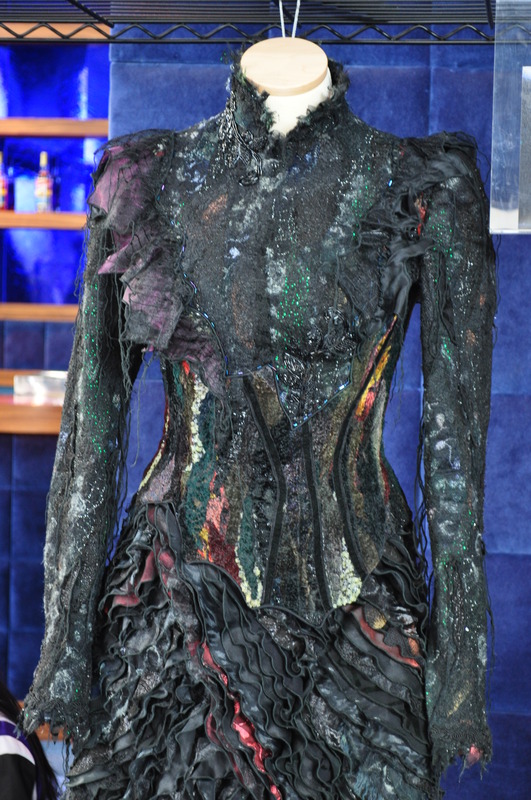 Some years ago, I went on the Wicked backstage ‘Behind The Emerald Curtain’ tour, during which we were able to see some of the costumes, including Elphaba’s black dress from Act 2. It’s not a black dress. Why does this matter? I can only presume that this dress costs a lot more to make than Margaret Hamilton’s simple black number in 1939. As each Elphaba will need her own dress, that is three dresses per production to cover understudies/stand-bys. While the producers do not publish the cost of the dress, several online gossip sources suggest that each dress costs $20,000. So that’s $60,000 per production. For a ‘black’ dress. Does it need to be multi-coloured? Yes, it looks beautiful up close, but from Row C, let alone Row Z, it looks black. The excellent Galindaswardrobe has an amazing level of detail of the costumes from Wicked, which show that it is not just Elphaba’s dress that may have been overengineered. Suffice it to say that, if I had been an investor in Wicked, I would have been tempted to question the need to spend $20,000 a piece on black dresses. With a $14 million initial investment and a $800,000 nut (weekly operating budget) the risks for Wicked pre-launch were enormous. In reality it grosses over $1.5 million per week and paid back its initial investment within 14 months. So while the cost of Elphaba’s dress might not matter, it might have done for other shows. A less spendthrift costume budget, combined with other savings, might make the difference between a show being a hit or a flop. 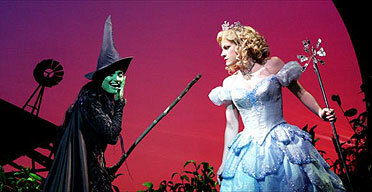 Is Wicked any more successful because Elphaba’s black dress is a $20,000 multi-coloured, multi-layered dress? I doubt it. But Susan Hilferty was not going to win a Tony by designing a $100 black dress. The commercial success of Wicked should not provide a justification for unnecessarily expensive costumes. And the Royal Opera should find a cheaper laces supplier. Behind The Emerald Curtain dress: copyright the author. Fair use rationale: No free or public domain images have been located for this film. The screenshot is intended to represent a well known and significant scene in a well known and significant film. The screenshot is intended to demonstrate the colour and simplicity of the costume relative to the Elphaba character in the Musical Wicked and an image is considered necessary to show it. rather than attempt to describe it.The image is used for informational purposes only and is not believed to detract from the original film in any way. This entry was posted in Theatre, Uncategorized and tagged behind the emerald curtain, bloglovin, Broadway, costumes, elphaba, expensive, galinda, galindas wardrobe, glinda, margaret hamilton, musical, roy, royal opera, royal opera house, theatre, West End, wicked, wicked musical, wicked witch, wizard of oz by showbusinessinsights. Bookmark the permalink.